Over the past two months I’ve spoken with many of the stakeholders involved with the 5M development, as well as the creative placemaking projects that are helping to shape the changes in the culture and landscape throughout San Francisco, these include: Deborah Cullinan, former Executive Director, Intersection for the Arts; Jamie Bennett, Executive Director, ArtPlace America; Angelica Cabande, Executive Director, South of Market Community Action Network (SOMCAN), Jessica Van Tuyl, Executive Director, Oasis For Girls, April Veneracion Ang, Senior Aide to Supervisor Jane Kim, District 6 and former Executive Director of SOMCAN; Tom DeCaigney, Director of Cultural Affairs, San Francisco Art Commission; Bernadette Sy, Executive Director, Filipino-American Development Foundation (FADF); Josh Kirschenbaum, Vice President for Strategic Direction, PolicyLink, and an anonymous source within Forest City Enterprises. ​We are in the eye of one of the most intense and thorough-going storms of acquisition and consolidation of wealth and power in history, one that is leaving a larger share of humanity out of its benefits while expanding its exploitive capabilities over them, and is able, at the very same moment, to tell the world with a straight face that it is about empowerment for all! Art Strikes Back was an 8-week performance series along San Francisco’s Valencia corridor in the summer of 2000 that Lise Swenson, Tim Costigan, and I launched in response to the unprecedented level of evictions and displacement that we were experiencing during the Bay Area’s first dotcom boom. 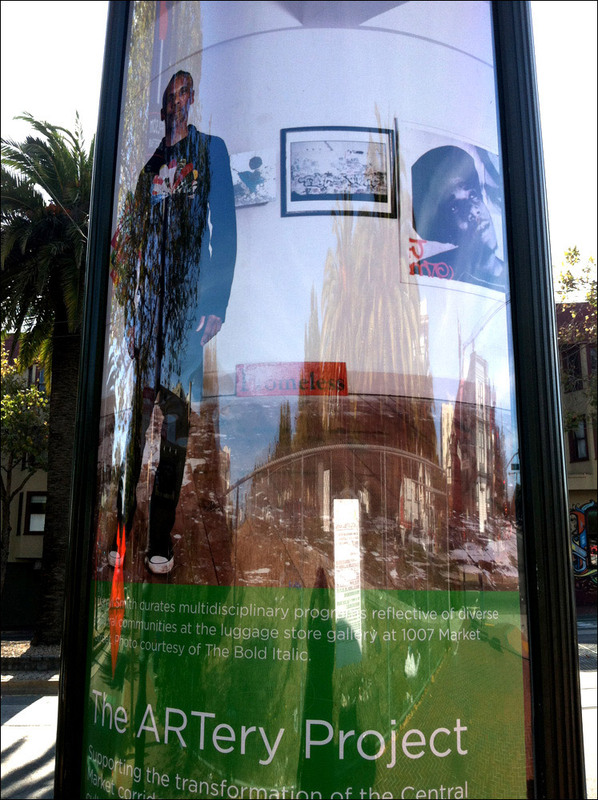 Over 70 artists participated and the project was covered in local, national, and international publications, including the San Francisco Chronicle, National Public Radio, and the London Telegraph. 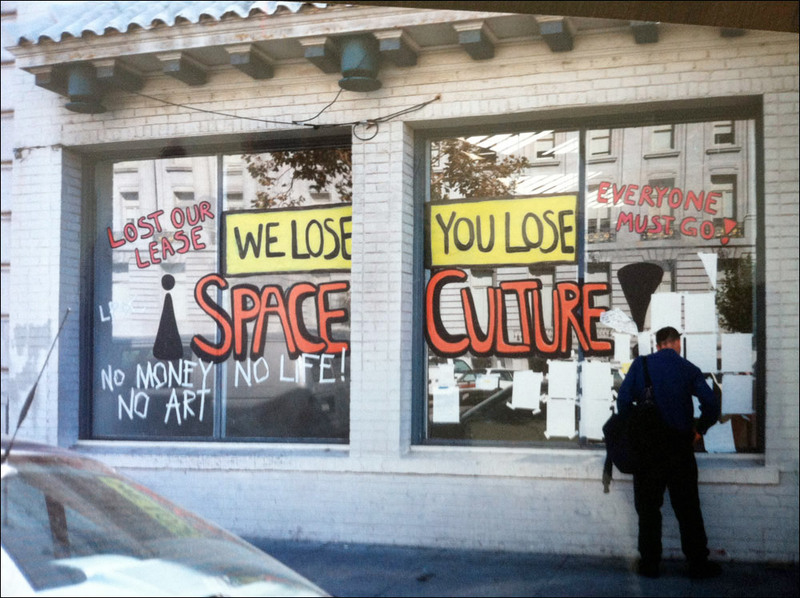 The project was also accompanied by the installation We Lose Space that Gordon Winiemko and I created at the San Francisco Art Commission’s Grove Street Gallery across the street from City Hall. The exhibition included interviews with a cross section of members of the Bay Area’s artistic community, including dancers, visual artists, musicians, and arts administrators. We responded passionately and with great resistance, determined to maintain our neighborhoods, as we knew them. 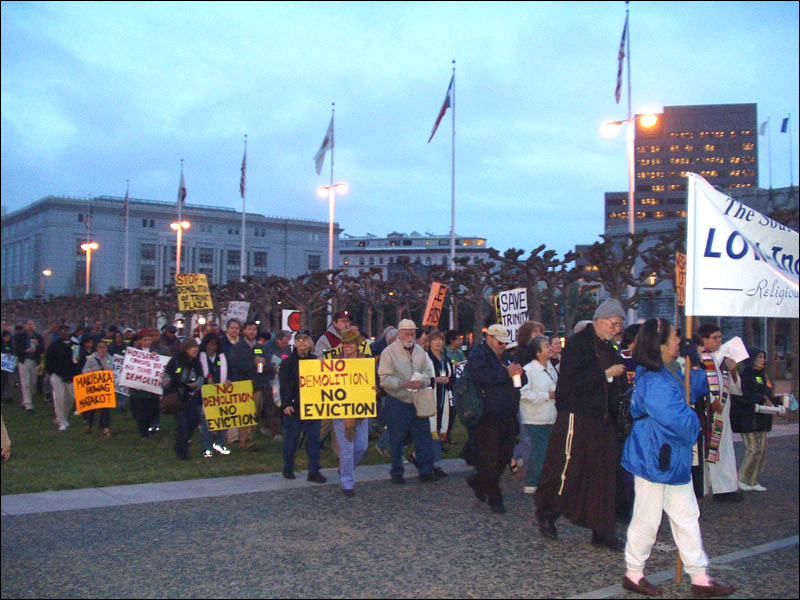 Protest marches were organized, rallies were held at schools, neighborhood centers, and City Hall, organizations such as MAC (the Mission Anti-Displacement Coalition) and SOMCAN (the South of Market Community Action Network) were formed, and many artists, like those who participated in Art Strikes Back, contributed through poster campaigns, performances, graffiti, murals, and other public projects. 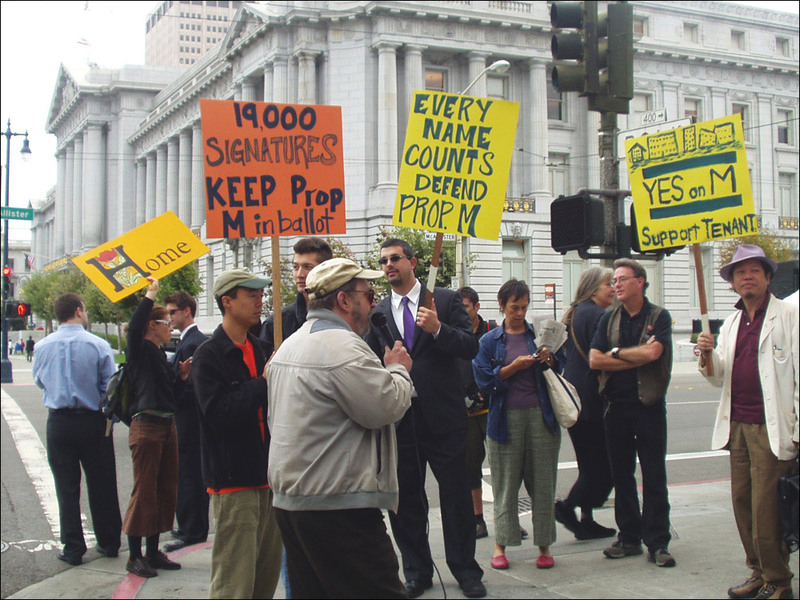 We rejoiced in 2000 when San Francisco elected a new, progressive Board of Supervisors, and again in 2001 when the dotcom bust hit. We thought we’d won. Fourteen years later, the wealth gap has continued to grow in the U.S. with the top one percent’s share of wealth increasing by almost 8% between 2000 and 2014. San Francisco is again in the midst of a tech boom and class war that includes: tax giveaways to tech companies in the mid-market, questions surrounding the lack of regulation and taxation for private transportation shuttles (“Google buses”) and the “shared service economy” that includes companies like Airbnb, Lyft, Uber, Sidecar, and evictions at their highest level since the last peak in 2001/02. However, the climate of the arts community feels very different this time around. Not as unified, not as activated, more complacent, and in general more aligned with the interests helping to gentrify the area, due in part to the rapidly changing demographics of the Bay Area (younger, whiter, wealthier), as well as an increase in funding for and opportunities tied to creative placemaking projects. The term “creative placemaking” is the latest spin on a decades-old strategy of incorporating the arts into economic development models, the idea being that art can inspire both shared economic prosperity while energizing the overall community. 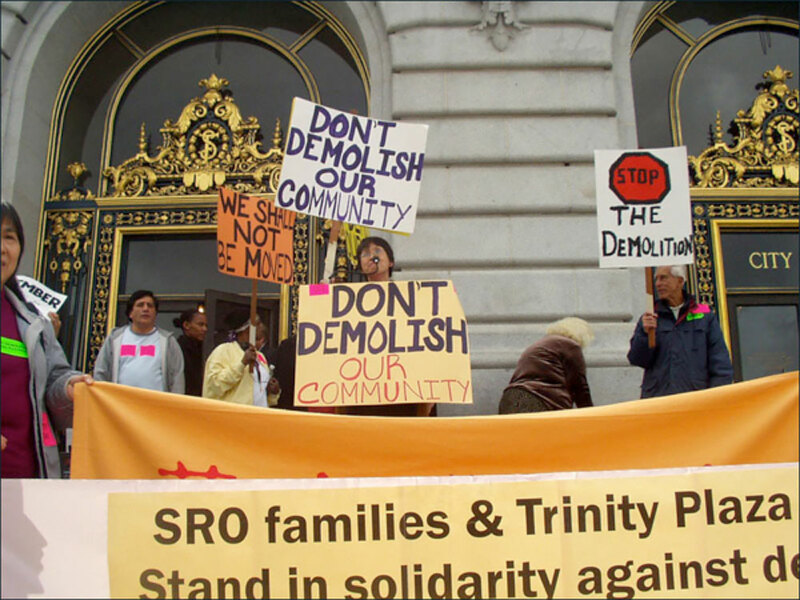 However, as I’ve learned from working closely with many community-based organizations (CBOs) in the Bay Area in development and planning over the past 18 years, if the existing neighborhood stakeholders – longtime residents, CBOs, small businesses, social services and public agencies who serve them – are not driving the process, community development or revitalization, as it’s often characterized by city planners, can also be highly problematic. Outside interests (developers, real estate agents, corporations, policy makers, or new residents) who do not have long-established roots within an existing neighborhood can end up destroying years of coalition building, networks of trust, and community frameworks that have proven to be successful and integral to the health of the neighborhood and its residents. This challenge coincides with the oft-noted role that artists and arts organizations play as an unintended force in the gentrification of communities. This is especially true when deeply established relationships and organizing efforts already exist and then become undermined by arts projects that haven’t been a part of these rooted networks. However, it is also important to establish a clear understanding between the term “gentrification” used in the context of: 1) community-spearheaded development that provides greater amenities, services, and economic opportunities e.g. more parks, public art and creative outlets, better schools, greater access to healthy food options, more jobs, increased public transportation etc. ; and 2) developing high-end housing, upscale retail, more expensive services, privatization. In the former context, these are virtuous goals for a city to aspire to provide for all its citizens; the latter often leads to the displacement and destruction of existing communities, especially low-income communities of color. While it’s not really apparent how “creative placemaking” is conceptually different from any of the previous institutional models that have incorporated the arts into the process of community economic development, or from the informal work that’s already being done in and by communities themselves, several factors do seem divergent. These include: new and higher levels of funding devoted to creative placemaking, an increase of private sector involvement in the development and direction of the projects, and the additional promotion, or marketing specifically devoted to this strategy (one of my favorites is the Kresge Foundation’s PSA, which looks like it might have been developed by Chevron’s public relations firm). There is also a concern that while additional funding opportunities for artists and arts organizations is a greatly needed resource, project-based funding such as creative placemaking initiatives is not what is needed. Rather what is truly essential for the survival of artists and arts centers is general operating funds, or funds to secure affordable housing/studios or the acquisition of property. However, in many cases artists and arts organizations will jump on board and rally heavily in support of new funding priorities and models initiated by funders because they're desperate for the monies attached in whatever form, amount, or capacity they may serve. This is not to say that the foundation staff leading these initiatives don’t have the best intentions, it’s to say that they too can be driven by priorities and decisions set forth by a foundation’s executives and members of its Board of Directors. 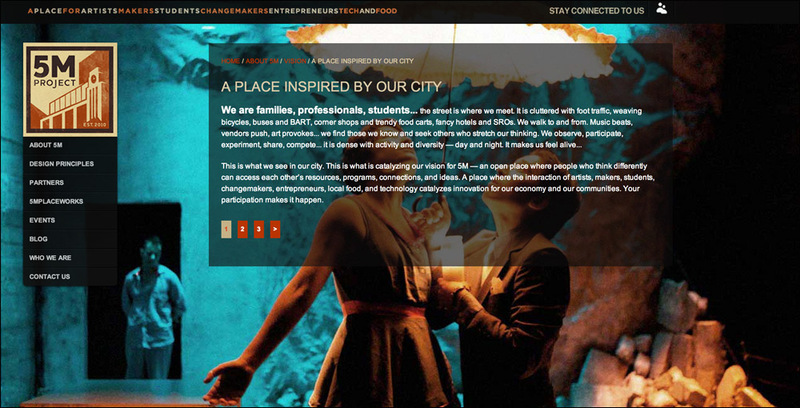 ArtPlace has invested in initiatives to revitalize neighborhoods; stimulate job growth and economic development; create new anchors for communities; increase the appeal of transit corridors; bring new economic opportunities to rural communities; build brand for communities; address urban challenges; connect people and help them tell their stories; provide artists’ housing and workspace; and foster research in creative placemaking. While ArtPlace’s unprecedented investment of foundations, federal agencies, and financial institutions in local arts non-profits appears to be a great opportunity for these organizations to help shape community development, it also presents the potential for the aforementioned concerns associated with community planning and gentrification. 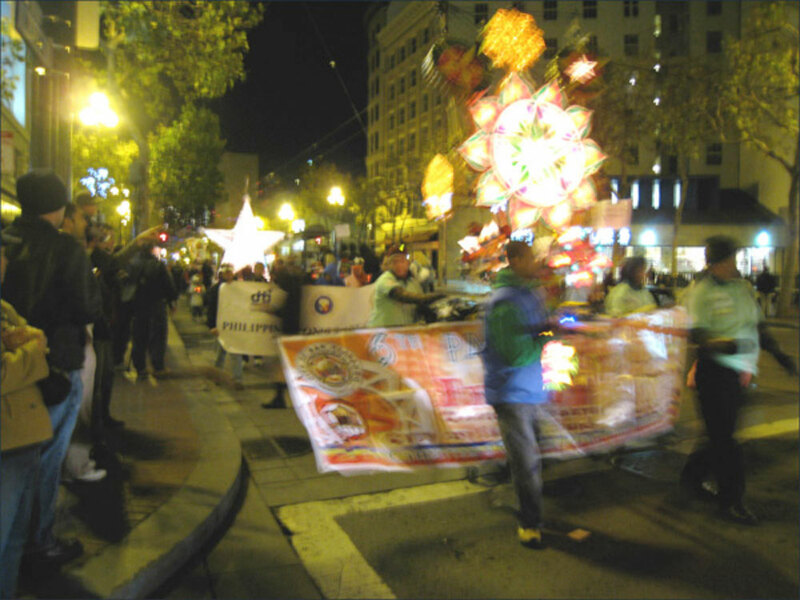 Among ArtPlace’s first round of grantees in 2011 was San Francisco’s Intersection for the Arts with an award of $777,000 for its 5M Project, the third largest grant of the 34 projects selected. 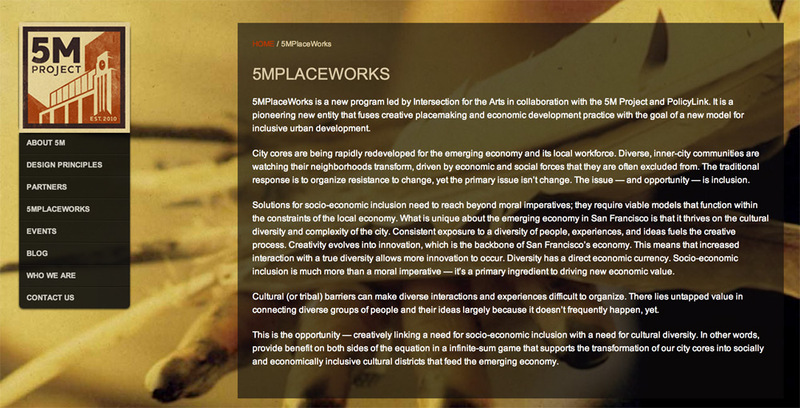 The 5M Project provides a great example of the intersections between art, technology and gentrification that the Bay Area is currently experiencing and raises questions around the effectiveness of an institutionally funded creative placemaking project not driven by the community it’s based in and the challenges it can present for the participating arts organization. According to Deborah Cullinan, former Executive Director of Intersection for the Arts, by 2008 Intersection had outgrown its Mission District home of over 15 years. At that point Intersection began looking at different models for sustainability, which included the potential of owning their space. Through the process of looking for a new space, Intersection met the directors of The Hub, a global membership organization for social entrepreneurs. Following several discussions, the two organizations decided to become partners in their search for a new location and developing a model for integrating art into social entrepreneurship. Not long after that decision, the Hearst Corporation and Forest City Enterprises contacted Intersection to discuss a potential collaboration that would become 5M’s creative placemaking project, which includes a permanent home for Intersection for the Arts within the proposed development. 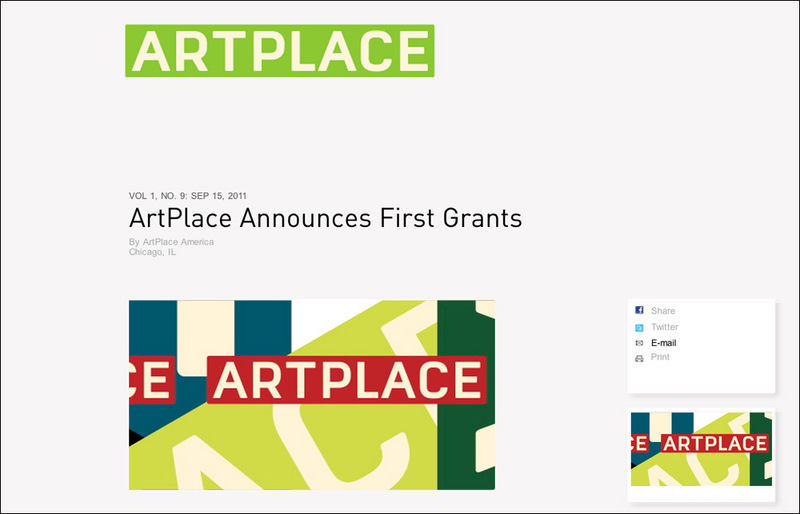 The organization moved ahead with the partnership and was subsequently awarded the ArtPlace grant. Intersection for the Arts and Forest City Development have forged a unique partnership rooted in a shared belief that art and creativity realized through meaningful, inclusive, and collaborative places fuels vibrancy and facilitates positive change. Together, we are working on a four-acre multi-phase, mixed-use development project called 5M. Located at the intersection of several beautifully distinct neighborhoods in the middle of downtown San Francisco, 5M is a prototype for the next generation of urban development that embraces diversity of thought, life experience and culture as essential to positive economic and social change in our neighborhoods. We have brought together makers, artists, entrepreneurs, social change agents, and technology innovators to collaboratively develop a new kind of place that unlocks resources, connection, and creativity across silos and disciplines. 5M’s tenant community – already representing more than 1000 organizations and networks – offers a unique opportunity to build a large scale, diverse ecology that is artfully woven into the fabric of the surrounding neighborhood. With 5M, we propose that art – creative collaboration, placemaking, and problem solving – builds understanding and community, celebrates and mobilizes neighborhood assets, and drives inclusive change. Over the next several years, Intersection, Forest City, and our partners at 5M will lead programming that will drive local economic and community development and innovative change – through on-the-street public art, arts-based community engagement, artist residencies, cultural entrepreneurship fellowships, job-training, incubation and resource-matching. It’s worth noting the verbiage used to portray the intent, which is similar in tone to the description of ArtPlace’s impact for its recipients. 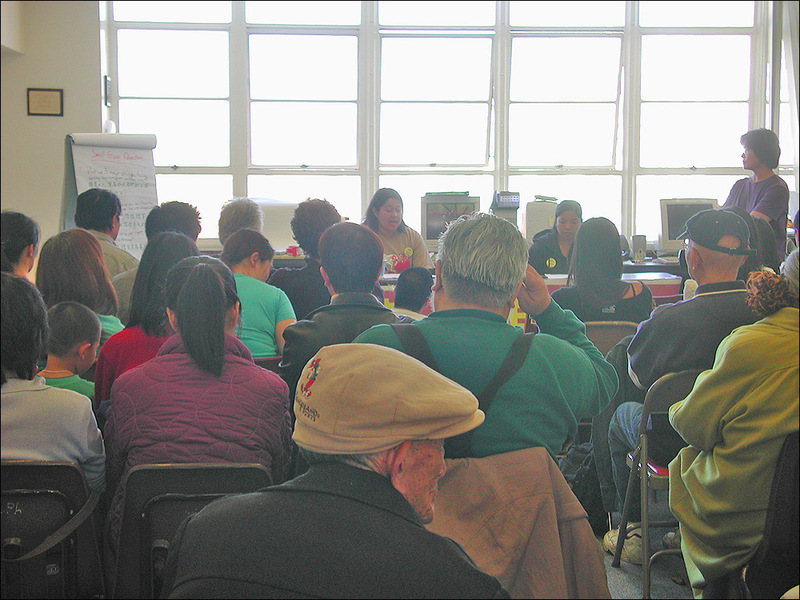 It’s interesting that for such an ambitious community place-based project, located in a primarily low-income neighborhood that is historically diverse (Filipino, Chinese, Latino), there’s nothing that acknowledges these communities or suggests any sort of commitment to them such as the preservation of the neighborhood’s diversity, the provision for on-site low-income housing, job-training that includes translation services, and/or the commitment to hire from within the SoMa community.” Basically there’s no real commitment to anything or anyone, just rhetoric. Intersection for the Arts is the oldest alternative non-profit arts space in San Francisco, incorporated in 1965 and has a long history of supporting projects that are rooted in a social justice framework. 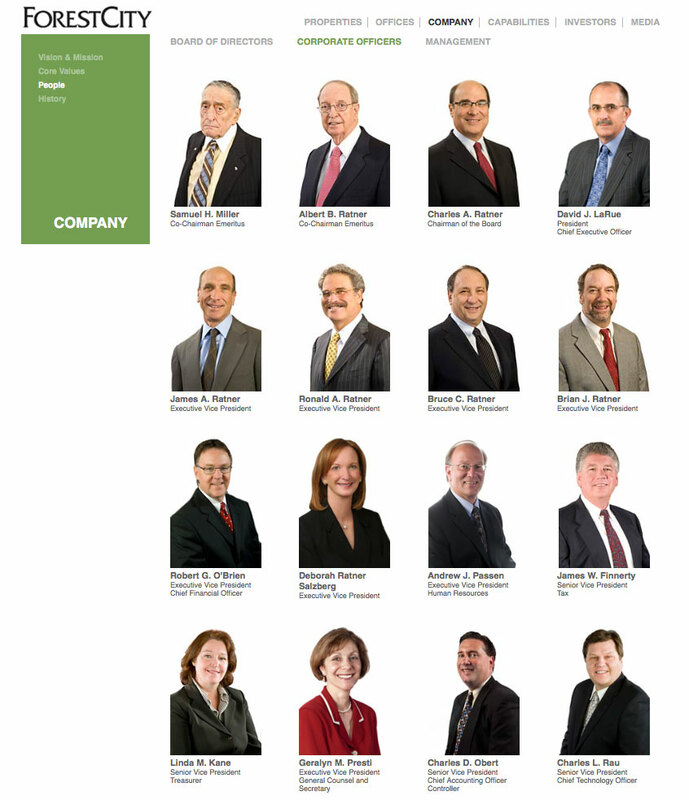 In contrast, Forest City Enterprises (formerly Forest City Ratner) is a $9 billion, publicly traded real estate management and development corporation based out of Cleveland, Ohio and with a history of using questionable practices to displace communities, including the use of eminent domain. One of the most high profile cases of this practice was in the completion of the Atlantic Yards project in the Prospect Heights neighborhood of Brooklyn. The 2011 award-winning documentary “Battle For Brooklyn” chronicles the development of the project and the subsequent break down of the neighborhood that was seized. The 5M Project is housed in the San Francisco Chronicle building in the South of Market neighborhood. The community historically has had a strong network of social justice, community organizing, youth, labor, veterans’ equity, arts organizations, and small businesses who have often worked together for years to serve the neighborhood’s low-income families and individuals. 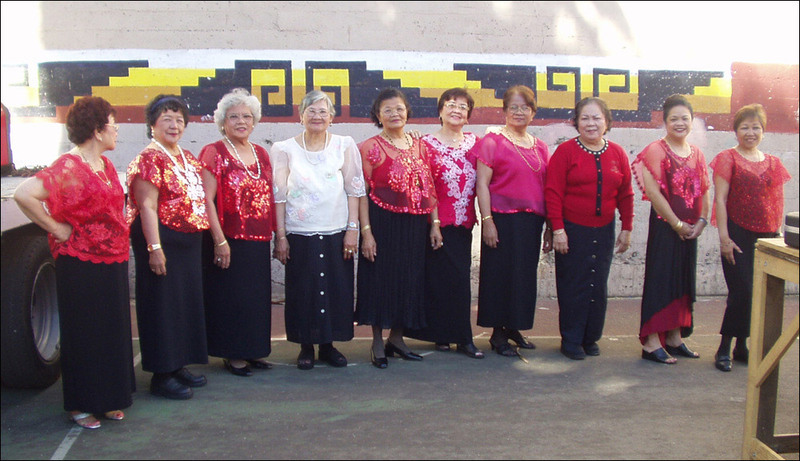 Additionally, the community is filled with existing public art projects, murals and installations; performances and community festivals such as the Parol Lantern Festival & Parade, the Pistahan Festival & Parade and SoMaFest; as well as numerous independent and institutional art spaces, all of which the community has created, helped to develop or supported for over 20 years. Therefore, from the outset of the 5M Project it’s been difficult to envision how Intersection for the Arts as a new organization in SoMa – working with a publicly traded, for-profit development corporation – could possibly create any sort of healthy community-based prototype. This skepticism is not in anyway a reflection of Intersection’s integrity as an organization. Quite the contrary, since its beginnings Intersection has been creating and presenting some of the very best community-based arts programming in the country, committed to raising awareness and social consciousness around critical issues of justice and equity. Their exemplary programming is due in large part to their staff, and in particular the curatorial visions and tireless commitments of its longtime program directors Kevin Chen, Visual Arts, Literary & Jazz Program Director and Sean San Jose, Performing Arts Director. Rather the concerns here are for the potential complications that can arise from: 1) an organization such as Intersection whose commitment has always been to support a platform of social justice through the arts entering into a public-private partnership with a publicly traded corporation whose commitment is to maximizing the profits of its shareholders; and 2) the pressures that can arise to fulfill the objectives of a time-sensitive place-based grant award when the grantee is new to the community and doesn’t have the opportunity to organically develop relationships within its new neighborhood. We're being told how this project is going to benefit our community but yet we're still not seeing that and we haven't even talked about the impacts, not only the displacement and gentrification impacts, but also the traffic impacts and open space. There are many things that need to be looked at to make sure that there is really good community planning when you're developing a project like this. And so far we haven’t felt that the community has been included in that process. 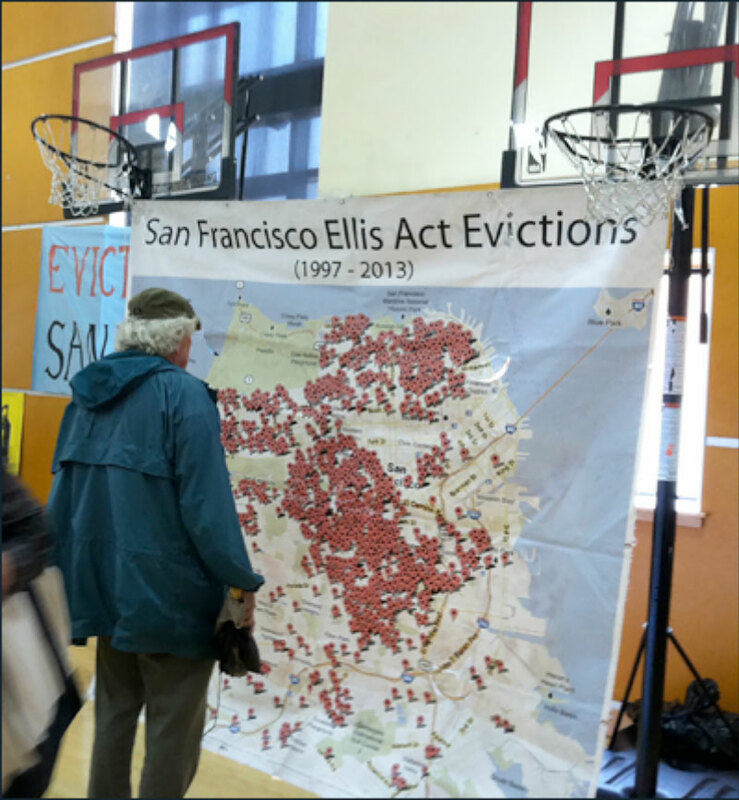 The SoMa district has already been significantly impacted by the changes that have been evolving for over a decade, due in large part to city planning and policy decisions and legislation that have favored the developers, corporations, and those with upper incomes moving into the neighborhood. Cabande also noted that the most promising facet of the 5M/Intersection/ArtPlace collaboration for the neighborhood’s established community organizations was the partnership with PolicyLink, a national research and action institute based in Oakland that works to advance economic and social equity. PolicyLink was brought on to the project in 2012 by 5M to provide policy recommendations and help shape the project’s approach to inclusive change. PolicyLink’s model for community development is to “connect the work of people on the ground to the creation of sustainable communities of opportunity that allow everyone to participate and prosper by offering access to quality jobs, affordable housing, good schools, transportation, and the benefits of healthy food and physical activity." 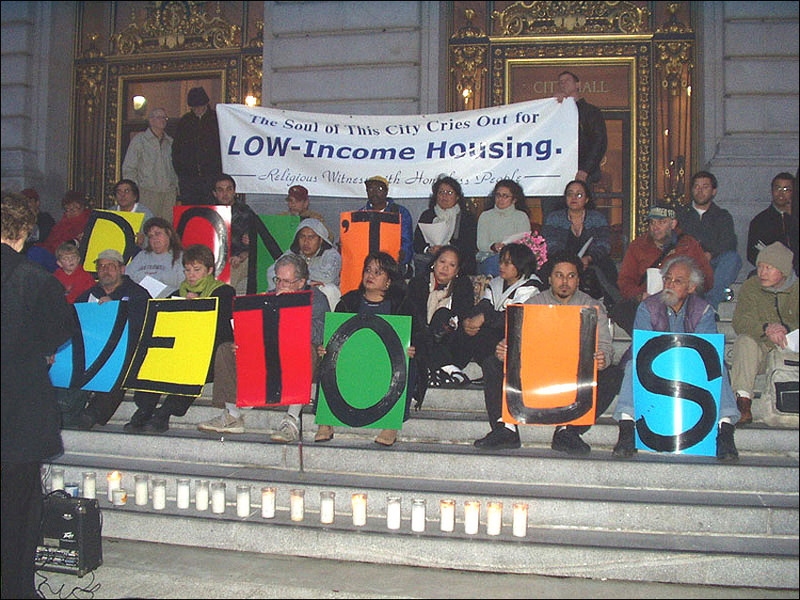 An equitable community benefits agreement for a project such as 5M might include: a guarantee of X# of jobs for local low and middle-income residents, 30% onsite low-income housing units, a wall-to-wall living wage, 65% local hire, 100% new construction jobs for San Francisco residents, a community-based job training center for the project, and restrictions against the use of temp agencies. The PolicyLink contract to include the prototyping effort, which would have included working with local groups like SOMCAN, was not fully executed. Instead, Intersection and Forest City decided to implement this phase on their own. 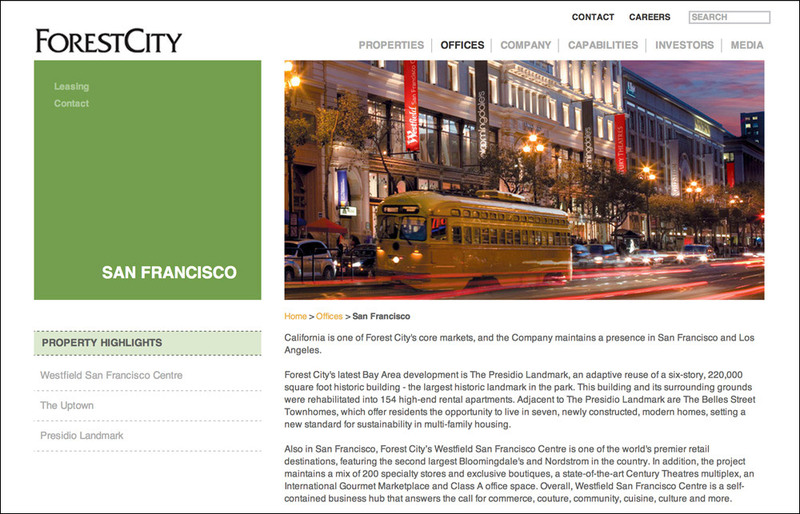 Additionally, in the predevelopment phase, Forest City was not able to advance the comprehensive portfolio of equity recommendations developed by PolicyLink, which ultimately diluted the potential impact of the recommendations. It is also challenging to work with a publicly traded corporation in which the company’s executives have a fiduciary responsibility to their shareholders to maximize their profits. However, processes such as Environmental Impact Reviews that are required for the city to approve proposed projects can provide an excellent opportunity for greater scrutiny and analysis in support of recommendations that necessitate social responsibility, affordability, and cultural competency as profit-maximizing strategies – for all stakeholders. The 5M Project is also raising many of these same questions for Forest City’s newest project, Pier 70. 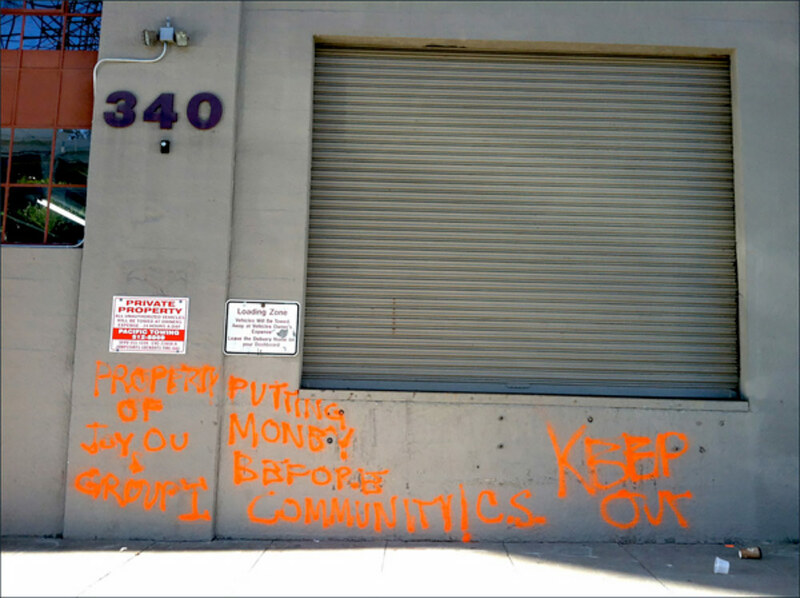 The controversial development is using the creative placemaking strategies of 5M, while drawing similar community concerns for the impact that it will have on the Dogpatch neighborhood, as well as the bordering Bayview Hunters Point. So the way that that project is setup is that there is a kind of phase zero, let's play, let's populate all the vacant space, let's try to create as below market as we can and allow for a lot of synergy and a lot of creativity and let that feed how the longer term unfolds. At that time we said we would not do that because we know that story - we are going to come in and it's going to be super awesome and we are not going to be able to stay because we can’t afford it. And so that was immediately addressed and I'm not at Intersection anymore so I cannot tell you what is happening but I do know that Forest City remains committed to art being an integral component of the ongoing site. I think if you look on their website right now, you can get a sense, though I think they are shifting out websites right now, but I think you can get a sense of that even by looking at how they are laying out program. When I looked at the 5M Project’s new Website what was most striking to me was how minimal and non-descript it is now in comparison to the original. 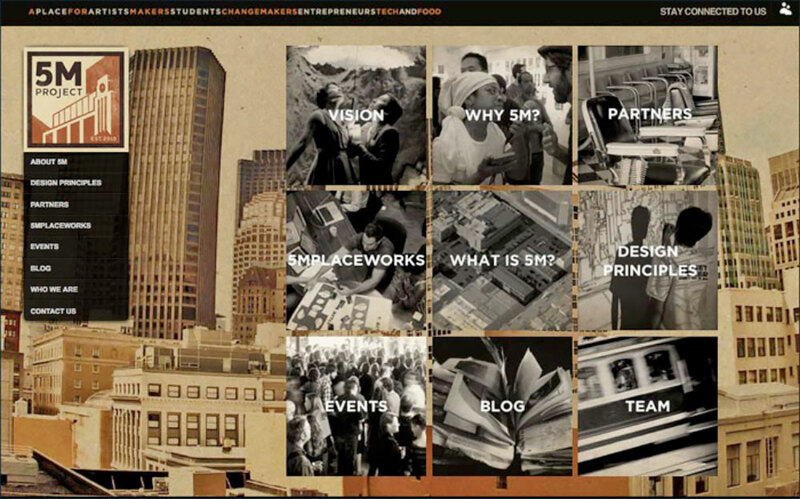 The Website initially developed for the project used much of the same marketing language as the ArtPlace description and also included images of the “5M Team,” a majority of these members represented by Intersection’s staff and images from Intersection’s programming. 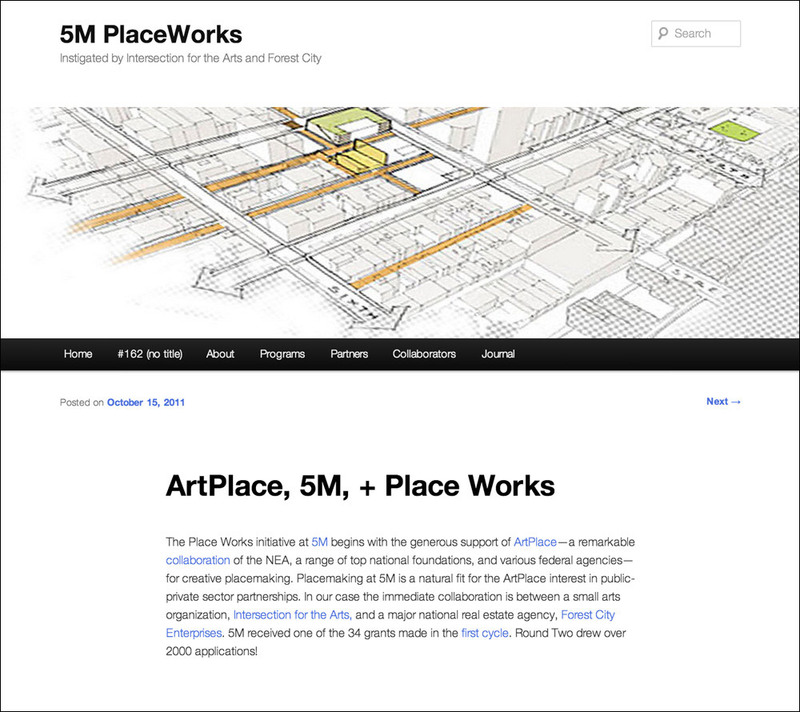 The original site also included significant references to the arts and a full description of the 5M PlaceWorks program with Intersection. This is now all gone. It made me question – why the new site? Why the lack of representation of Intersection beyond a mention on their list of partners? The 5M Project includes multiple organizations focused on the arts, making, entrepreneurs, food and technology, and believes they are important contributors to the project's current success and to the future development. Through the ArtPlace grant, Intersection for the Arts has used the site at 5M as a testing ground for finding new ways to advance local community development ideas with activities like the Urban Prototyping Festival; ongoing public chalkboard art along Minna Street; and, the 5 W's, an urban art installation that is a part of the Trailblazing effort in SOMA and the Tenderloin. For the 5M Project, these successful examples further reinforce the role of arts at 5M and we remain committed to future partnerships with a variety of arts partners as a way to highlight the importance of art in the community. – Alexa Arena, Sr. Vice President, Forest City. In August of 2012 artist Patricia Rodriguez invited me to lunch at her home in Oakland to discuss a potential project. I’d studied Rodriguez as undergrad at the University of Oregon and her role as a co-founder of Mujeres Muralistas, the first Chicana women’s mural collective in San Francisco. I was grateful to have the opportunity to spend the afternoon with someone I’d respected for many years. 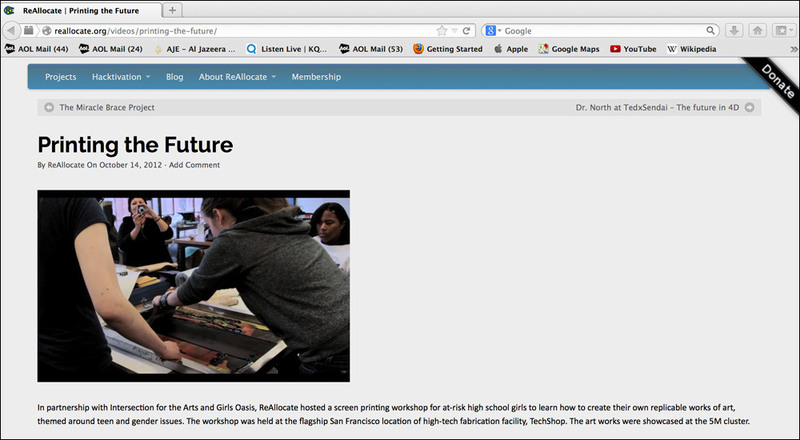 During lunch I learned that Rodriguez had recently worked with the Oasis For Girls as an instructor for a printmaking class. Oasis For Girls is a non-profit based in SoMa that works with young women of color from under-resourced communities in San Francisco to help them cultivate the skills, knowledge, and confidence to discover their dreams and build strong futures. I too had worked with Oasis during their first eight years as a core member of their leadership team. We both agreed that the organization is an amazing space for girls and young women. Adding insult to injury, Rodriguez appears only briefly in a background shot in the video and instead was often moved outside of the frame during filming, while three additional young women were brought in and featured in the video as "ReAllocators". It was extremely disheartening to hear this, knowing Oasis and Intersection for many years and knowing what an inspiring opportunity it was for the young women of Oasis to work with such an accomplished artist as Rodriguez and one who has made significant and historical contributions to the arts in San Francisco, especially for young Latinas. 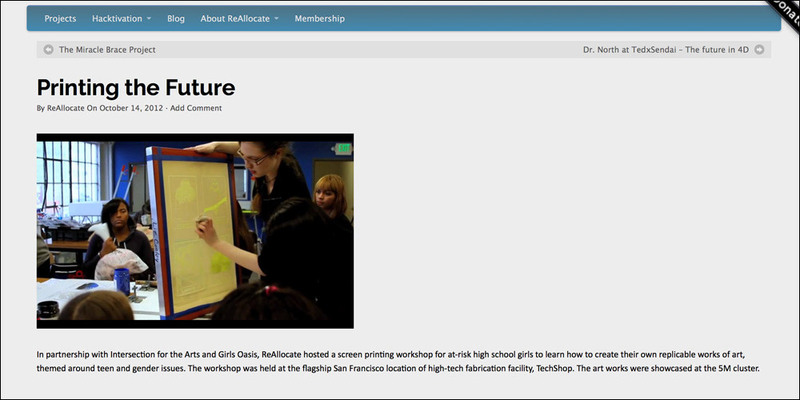 When the video was complete and posted on ReAllocate’s site the sole instructor listed was Liz Conley. 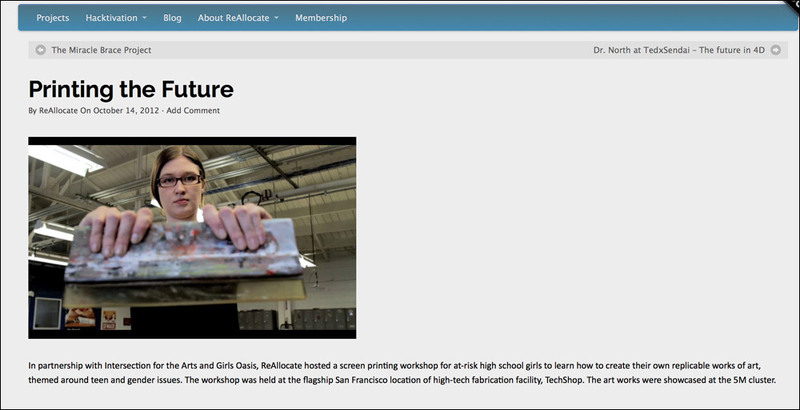 Rodriguez and WritersCorps were not credited anywhere on the video and Oasis For Girls was credited as “Girls Oasis.” Additionally, the project was described as a workshop in partnership with Intersection for the Arts and "Girls Oasis" hosted by ReAllocate. Several months later, an artist friend from Los Angeles, who had previously lived in San Francisco, called me. She’d seen the 5M/ReAllocate video at the non-profit Self Help Graphics & Art, a visual arts center in the Boyle Heights neighborhood of Los Angeles that serves a predominantly Latino community. As someone who was familiar with Intersection for the Arts and had worked with them in the past, she found the video to be a strange representation of the organization. She noted that the video was shown by a developer and representative of L.A.’s Redevelopment Agency to a group of artists and teachers as part of a proposed collaboration with Self Help Graphics & Art. I’m really sorry to hear Patricia had that experience. We have a lot of respect for her. She is a very talented artist. We really enjoyed working with her and our WritersCorps person did as well. Patricia is amazing … as an artist and a community organizer. She does have this amazing history. Subsequently, Van Tuyl contacted Intersection for the Arts to inquire about the video and was told that they too were unaware its existence. 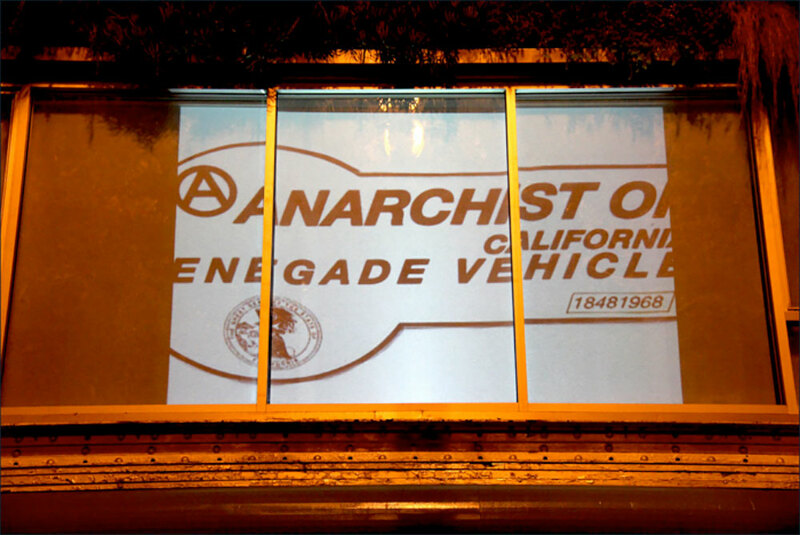 4) They were used as part of marketing campaign for a developer in Los Angeles. The Rainin Foundation is also working with the developer Joy Ou / Group I, along with the San Francisco Foundation, and Thatcher Family to support the development of the 950 Center for Art & Education at 950 Market, which Ou purchased in 2013. The project will potentially include 316 residential units, a 250-room hotel, a 75,000 square-foot arts complex, and 15,000 square feet of retail space. 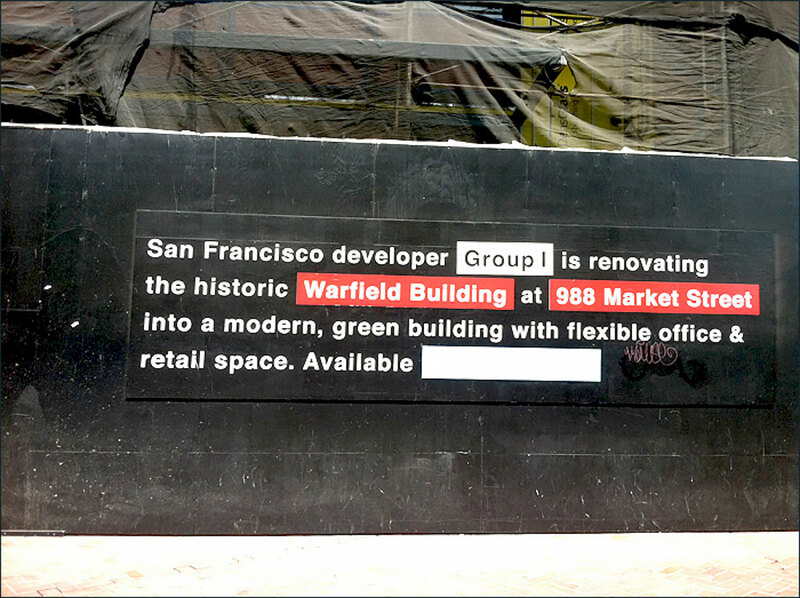 The 950 Market project is being designed by BIG, an architectural firm from New York. It should be noted that Ou is on the Board of Directors for the Wildflower Institute, one of the current finalists for the next round of ArtPlace grants for the project “Hidden Gems of the Tenderloin”, as well as on the Board of Directors of the San Francisco Art Institute, which did not support the successful efforts of SFAI’s adjunct faculty to unionize and join the Service Employees International Union (SEIU) Local 1021. Recently as I watched PBS’s Art21 segment on Barry McGee and Margaret Kilgallen, two of the most high profile and noted contemporary artists to emerge from the Bay Area in recent times, it was interesting to observe the Mid-Market as the place that had provided such inspiration for McGee and Kilgallen, yet is now in the process of being stripped of the character that they had noted. The Art21 profile follows the two as they navigate through the Mid-Market, sharing their influences – the handmade, the invisible, the discarded, folk art, and graffiti. Viewers also get a glimpse of McGee and Kilgallen’s studio spaces, personal, messy, creative and spacious environments that appear critical to their work. I felt an incredible sense of cognitive dissonance as I viewed the Art21 profile while considering Ou’s and other developers’ disconnect between the gentrified environments they’re helping to create, their displacement of the artists who are creating and contributing to the vibrant arts community that San Francisco has been known for, and their purported support for and of the arts and artists. It made me think of the ways in which gentrification isn’t just about the literal displacement of lower-income residents and the businesses and organizations that serve these populations. Rather, as historian and novelist Sarah Shulman similarly notes in her book The Gentrification of the Mind: Witness to a Lost Imagination, gentrification is also the homogenization of space - physical, mental, and creative. 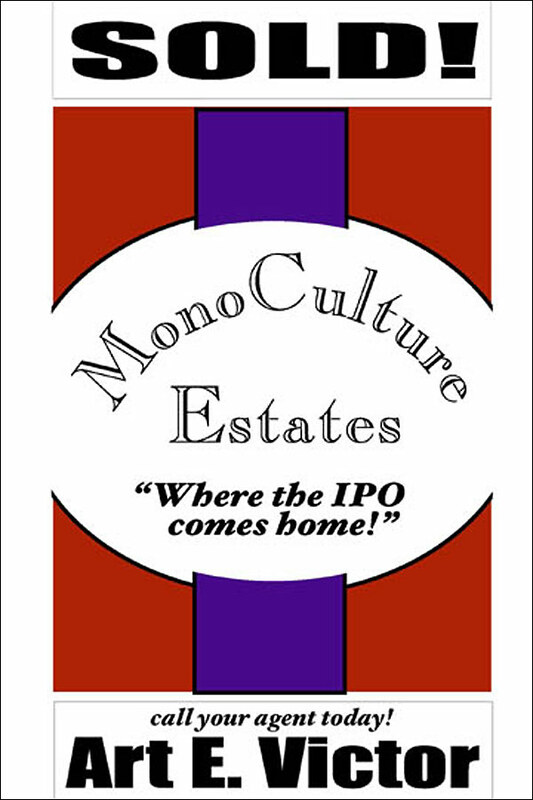 It’s the development of planned environments and gated communities; the elimination of critical thinking; privatization, the predetermined playlist, the consumer algorithm – it’s the culture of the lowest common denominator. Not all creative placemaking projects are as complicated or conflicted as the 5M Project or other new developments. 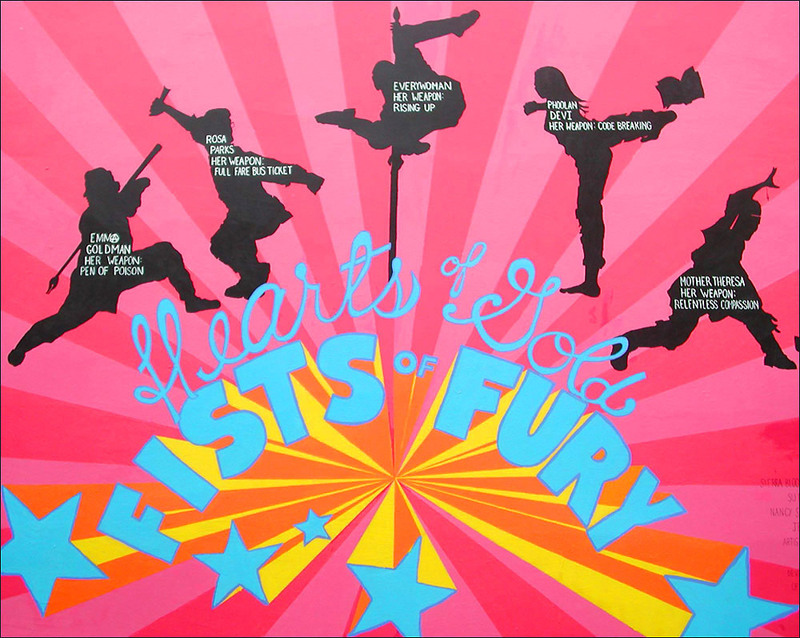 In 2010 the San Francisco Arts Commission (SFAC) launched its ARTery Project in the Mid-Market neighborhood with a $250,000 grant from the National Endowment for the Arts Mayors’ Institute on City Design 25th Anniversary Initiative (MICD25). 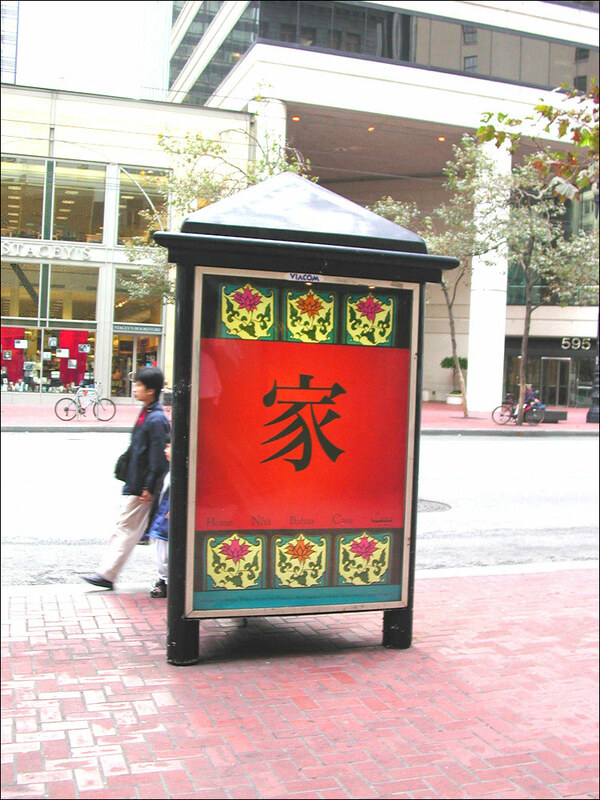 The program included 1) Art in Storefronts, installations in empty storefronts or public murals on abandoned walls; 2) Lights on Market Street, site-specific light installations; and 3) several large sculptural installations. ARTery also worked with neighborhood organizations to coordinate with festivals, exhibitions, and performances. As a viewer and participant, I found the project to be a success, providing public audiences from all walks of life – residents (housed and those living on the streets) and visitors with the experience of thoughtful, engaging and often inspiring contemporary art for free. 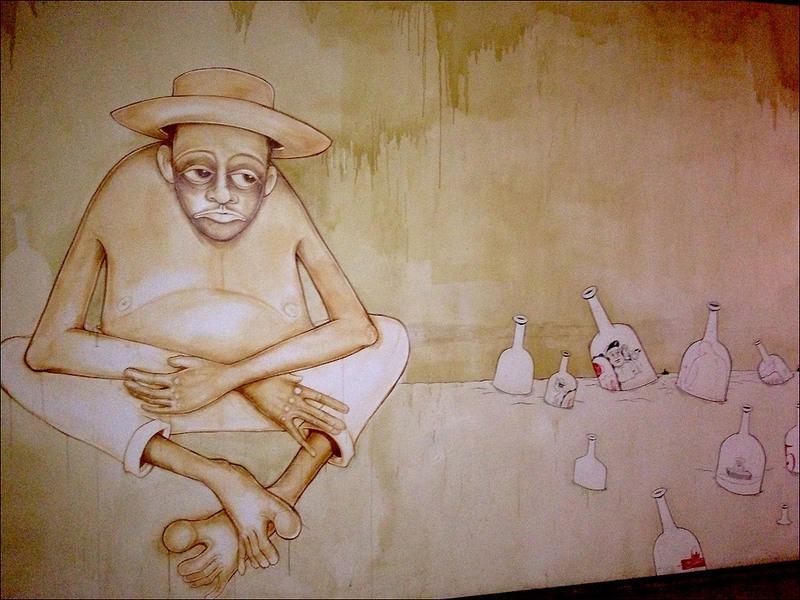 Many of the projects, especially the large-scale murals by artists such as Mona Caron, Paz de la Cazada, and Chad Hasegawa and the public video projections by artists including Adriana Varella, Akosua Adoma Owusu, barbara belloc, Carolyn Castaño, crystal am nelson, Eliza Barrios, Gina Osterloh, Jorge Bachmann, and TWCDC also provided an unexpected and refreshing alternative to the corporate messaging that saturates our public space. This was especially germane at a time when a feeling of economic uncertainty still weighed heavy in the air for many. It provided a sense of communal connection and possibility. Interviews included: Keith Hennessey, Rachel Kaplan, Jo Kreiter, Geoff Chadsey, Meg Mack, Scott MacLeod, Aaron Noble, and Benji Whalen, Mark Gregory, Will Johnson, Jaime Cortez (Galeria de la Raza), Krissy Keefer (Dance Mission), Trisha Lagaso Goldberg (Southern Exposure Gallery), Jill Weinberg Pfeiffer (Oasis For Girls), and Michael Medo Whitson (848 Community Space). “Creative Placemaking” was first coined by economist Ann Markusen in 2007 in her influential National Endowment for the Arts white paper, “Creative Placemaking” to define an urbanism that requires the presence of art and artists. This has included my non-profit development, management, and planning work with the following organizations and the communities they serve: Urban Peace Movement, Portola and Excelsior Family Connections, Oasis For Girls, Oakland Leaf, Creative Growth Art Center, SOMCAN (South of Market Community Action Network), Young Women United for Oakland, Streetside Stories, Youthspace, APIAHF (Asian Pacific Islander American Health Forum, The Luggage Store, Clarion Alley Mural Project, TILT, Southern Exposure, Meridian Gallery and The National Conference for Community and Justice. The 5M project is located in Census Tract (CT) 176.01 and borders CT 178.01)). The median household income of CT 176.01 is $23,099 and has gone down slightly from 2000. CT 178.01’s is $18,388. Thirty-eight percent (38%) of residents in CT 176.01 and 67% of CT 178 are foreign born (49.6 are Filipino in CT 176.01 and 56.9 are Chinese in CT 178). Seventy –four percent (74%) of children at Bessie Carmichael K-8 Elementary (the only school in the neighborhood) are eligible for free/reduced lunch. The 5M project is the overarching development for the 5M Creative Placemaking collaboration between Intersection for the Arts and Forest City Enterprises (the developer). 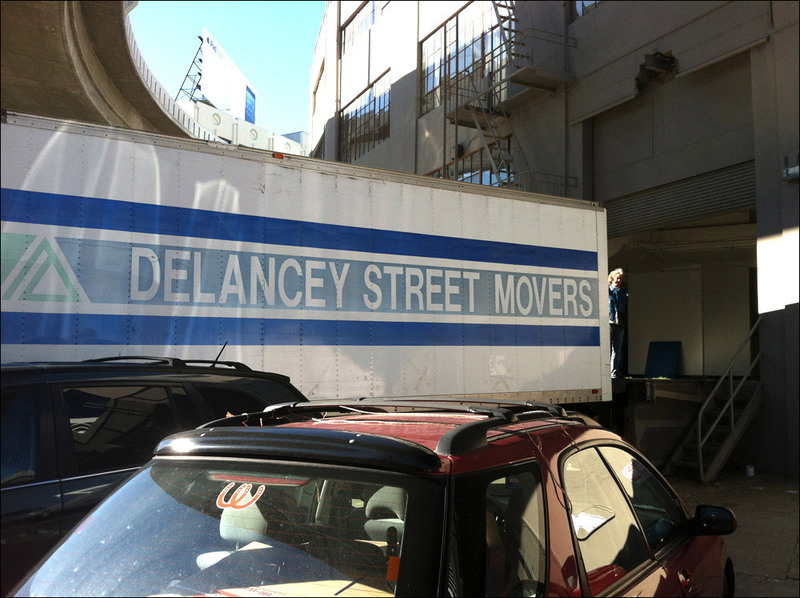 Intersection moved from their 446 Valencia Street Mission District location to the Chronicle Building at 925 Mission Street in the South of Market neighborhood in summer 2011. Written statement provided by Forest City, April 11, 2014. Intersection for the Arts 2012 Art Place Highlights provided by Arthur Combs, Interim Executive Director. From an email I’d written to Ou on June 22, 2012 to schedule a time to meet. Ou did follow up with several suggestions for potential studio spaces. The number of artists I cited to Ou at the time was 100+ based on the number provided to me by lease holders Durosz and Dupuis for the 2nd and 3rd floors of the building; however when I did a door to door count in the building in September of 2012 of the number of artists in the building (included visual, media, design, architects, filmmakers) I counted 152, and that did not include every studio in the building. Margaret Kilgallen died at the age of 33 in 2001 due to complications from breast cancer. I participated in the Luggage Store’s Projection Series, which used the gallery’s second floor windows for projected works visible from Market Street. I did not receive any compensation. 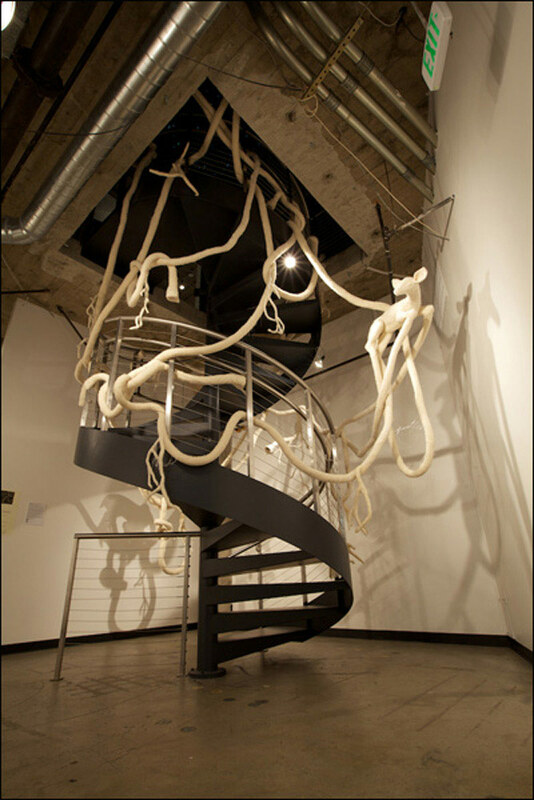 Written statement by Robynn Takayama in response to my request for a comment on the Artery Project, March 18, 2014. The Gentrification of our Livelihoods was originally developed for the Reengineering series on Art Practical at the invitation of Matt Sussman. The author would like to thank all those who participated in the development of the article, especially her partner and collaborator Christopher Statton for his support and assistance with the interviews and transcription and Stretcher for publishing the full version. — Megan Wilson is an artist, writer, non-profit consultant and community organizer based in San Francisco. best of luck you all. and Megan Wilson, good luck to you. we’re ALL niggas now. so true.